Additional research: It doesn't seem to matter what network I am connecting the Teleport to. I've recently tried two different networks at my office (Guest and Private), as well as my 4G hotspot. I also walked across the street and tried it both at Starbucks and Panera with no joy. This seems to be all better on the official 2.7.0 firmware. This exact same problem started after I updated to 2.7.0. Everything seems fine until the Home Network phase, then the connection fails just like you describe. @wouter-van-nispen-tot-sevenaer I've been having the same issue since the 2.7.0 upgrade as well. Any updates? @Christian-Striffler, @Wouter-van-Nispen-tot-Sevenaer, @Andrew-Kraut: Hi all! 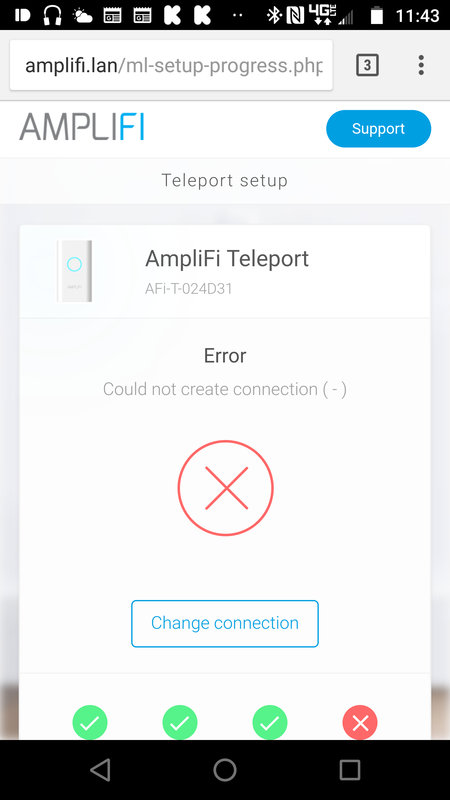 Could you teleport and router support files on http://amplifi.lan and send them to gunars.ritins@ubnt.com? Hi @ubnt-gunars - I have sent a support file for a Teleport, but I can't generate one for the router at the moment. What is very strange, on my iPhone, when I connect to the Teleport, it goes to the web portal and is just fails at the final Home Network check, and I can never access the internet because it always goes back to the portal page. But on my laptop, I can connect to the Teleport SSID and it shows the same failure on the web portal, but the Teleport is still acting like a mesh point on my remote network, so I can fully access the internet and everything, there just isn't a VPN connection to my home network. @derek-saville Thanks, we'll take a look at the support info. I've seen this a couple of times on pre-production units. Hi @ubnt-gunars - any update on this issue and how to fix it? @derek-saville Hi Derek! We'll be able to process it on Tuesday. @andrew-kraut hi Andrew! Are you still experiencing the issue? In your support file we see that the VPN connection is dropped after a short period of time. Can you generate router support info when the issue occurs? @ubnt-gunars Thanks for checking. This issue went away with the last GA release (before the 1.8rc's).